As a commercial solicitor, I’m often approached by people who are wanting to start a business in the Northampton area. A client told me recently how much he’d appreciated the advice I’d given him when he was setting up. After 5 years of successful trading, he was coming back for help with the next phase! The reason he was still successfully trading while many had failed was that he had the right foundations in place from the beginning. So what are these foundations? 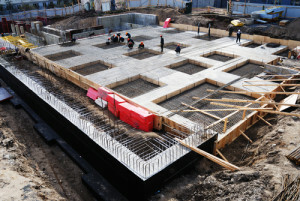 Here are 7 foundations on which you can build your Northampton business. Should you be sole trader, a partnership, a limited liability partnership (LLP), or a limited company (Ltd.)? There are advantages to each, but you should choose the option which suits the way you work, and what risks you are willing to take on yourself. A sole trader is just you, trading in your own name. You keep all the profits and pay income tax for which you will have to make an annual return to HMRC. You are also responsible for all your own debts. A partnership is you and someone else, often two partners with an equal share of the business. You agree on the share of the profits, but are all equally liable for the debts. You all pay tax on your own income, and make returns to HMRC. A limited liability company is owned by its shareholders. Limited companies are legal entities in their own right, distinct from their owners and directors and have to be registered and file annual accounts with Companies House and make tax returns to HMRC. A company must have at least one director and one company secretary, though many small firms use their accountant or solicitor as company secretary. The big difference is of course that as a separate legal entity, you are not personally liable for the company’s debts, but beware of personal guarantees with big suppliers and banks. A limited liability partnership has the same structure as a partnership, with profits being divided according to the partners’ agreement, but with the protection of limited liability. Will you be trading from home? Or from commercial premises? If you’re going to trade from commercial premises, will they be leased, licensed, or owned? Trading from home has the obvious advantage that you’re using premises you’re already paying for. In fact, you’re usually able to offset a portion of your rent or mortgage payments against your business and save on tax. However, you should first check whether there are any restrictions from the local planning authority (Northampton Borough Council for homes in Northampton), in your tenancy agreement, or in your deeds, as to the nature of business which can be carried on from your home. If there are any, and you’re not sure whether or not your business would fall foul of them, do take some legal advice from your solicitor. Commercial premises come at a price, but there are advantages in terms of credibility and convenience when it’s just you, and of course when you take on other staff you will need somewhere for them to go to work that isn’t your own home. There are many options in Northampton, from offices in Business Centres, to town centre offices, to light industrial units on industrial estates or nearer the town centre. How much working capital will you need, and how will you fund it? Will you invest your own money, or will you borrow? Even if you have enough money, investing it instead of borrowing is not always the most efficient way to fund your business working capital. Your cash-flow processes need to be thought out and followed from the beginning. Poor cash flow is one of the main reasons for business failure, but following a strict process of credit control can make life much easier. A tax plan needs to be thought out from the beginning… You’ll probably want to pay yourself but won’t want to make any more tax than you have to. Exactly how you arrange it depends foremost on whether or not you are a limited company or not, and if you are then you will be balancing your salary with your share dividends to minimise that amount of tax you need to pay. Insurance can be vital in times of crisis, but you need to have policies in place before the crisis happens. Professional indemnity insurance can be the difference between ruin and survival when things go wrong, but can be expensive, depending on your trade. If you are a company, or take on staff, you are required by law to have employer’s liability insurance, but it is not too expensive. Employment contracts are important to all businesses, large or small, but are sometimes overlooked in small businesses, which can be a cause for regret later, and the law does change! Policies and procedures, from equal opportunities to complaints handling, are also important, and often thinking about the carefully early on can save a lot of trouble later. Good policies and procedures also form the basis of ISO9001 accreditation. Contracts with customers and suppliers are the meat of any business, and it’s important to protect those relationships with contracts that reflect genuine agreement. Statutory compliance of course varies greatly depending on what sector or industry you’re in, but it’s important to stay up to date. Real estate, equipment, and and stock, are easily seen, but don’t forget that devaluation through age or stock wastage can reduce your tax liability! Intangible property like trade marks and goodwill are, of course, invisible but can be worth more than any other asset, especially for a small innovative company. Trade marks do not need to be registered to be enforced, but it helps, and can make some exploitations of you trade mark subject to criminal proceedings. Putting ‘TM’ next to the mark that you’re using a trade mark gives any other potential infringer notice that it is your trade mark, which will be important if you ever need to bring proceedings. Last but not least – the personal affairs of the owners, directors and managers are, of course, fundamental. It is surprising how many people immerse themselves in their business to ensure its success yet neglect their own well-being. It can all sound daunting. But the good news is that whilst there are certain essentials that have to be addressed at the beginning of any business venture, many aspects can be addressed as part of a planned process over a year or two, enabling you to get on with the business of doing business. Need to speak to a Northampton solicitor? For advice on setting up a business, call one of commercial solicitors on 01604 601 575 or complete the form below and we’ll call you back.